Macular Degeneration is a term that describes any deterioration of the retinal cellular structure in the center of the retina, the macula. It is most commonly used to describe Age Related Macular Degeneration (AMD), a progressive condition characterized by a loss of central vision. There are two forms of age related macular degeneration. The dry form, dry AMD, generally causes a slow, progressive loss of central visual acuity. It effects both eyes and may eventually cause a significant visual inability to read or to recognize faces or colors. The second form, wet AMD is characterized by sudden, acute loss of vision. Abnormal blood vessels develop underneath the retina to compensate for the loss of normal cellular function but these new vessels are fragile and may hemorrhage causing permanent damage to the retinal tissue. This can occur in both eyes but usually happens in only one eye at a time. Macular degeneration only involves the central part of the retina. Peripheral vision, side vision, remains healthy in this condition. Peripheral vision allows us to navigate our way around, to see objects moving from the side and to distinguish large objects. However, the peripheral retina does not have the retinal cones that permit fine detail vision. The central retina is dense with cone receptors. Within the past decade there has been a transformation for the prognosis of this disorder. New medications result in a much more optimistic future of what once was a condition without any other prospect than certain loss of vision. While there yet remains to be a cure for macular degeneration, vitamin supplements have been proven to help diminish some of the inevitable consequences. New pharmaceutical, laser and surgical treatments dramatically alter our ability to treat and preserve vision. Research in the area of macular degeneration is ongoing and even newer, more advanced therapies may be on the horizon. A clinical trial sponsored by the National Eye Institute one of the Federal government’s National Institutes of Health to study the effect of high doses of antioxidants and zinc on the progression of AMD first reported results in 2001. The study found a significant reduction in risk of advanced forms of AMD that result in vision loss. AREDS, Age-Related Eye Disease Study, supplements are found in the vitamin supplement section of the drug section of many convenient stores. No prescription is necessary. Talk to your eye doctor about vitamin supplements for you. A class of drugs known as anti-VEG F is the most recent and most commonly utilized treatment for the complication of AMD known as wet AMD. You may hear the brand names of these drugs; Avastin, Lucentis, Macugen or Eylea. You physician will carefully select the right drug and treatment regime for you. This treatment option was one of the first in the wave of new therapies in the advancement of treatments for the abnormal blood vessels that grow under the macula in wet AMD. It is a combination of a light-sensitizing intravenous drug (Visudyne or verteporfin) and the application of a laser. Until the availability of the therapy options above focal laser was the standard of treatment for wet AMD. Laser photocoagulation directs a highly condensed light at the retinal tissue in the area of the abnormal blood vessels. The light acts as a type of burn destroying the abnormal blood vessels. You will be a partner with you physician in monitoring the health of you eye. You will be followed at regular intervals but in the interim you will be instructed to report changes in vision and any side-effect of the treatment you may notice. Various sophisticated and complex forms of intraocular surgery are available for advanced complicated forms of hemorrhaging wet AMD. Encouraging results are developing in this area. For those who have advanced stages of AMD with vision loss; there is an array of optical devices and visual aids available. There are therapists who will assist you in learning how to maximize the vision you have and help you master the functions of daily living. Talk to your eye doctor if you are interested in this option. Amsler grid testing is a very sensitive method of detecting early changes in your central vision. 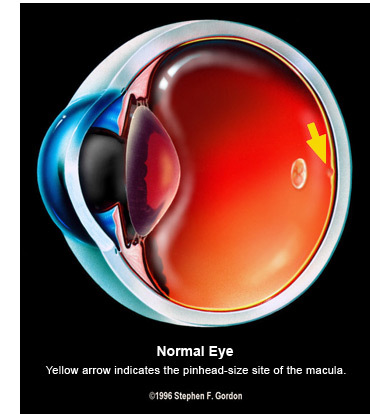 The macula is the portion of the retina responsible for fine vision, including reading vision. Detection of macula disease in its early stages may prevent serious loss of vision. Take the Amsler Grid Test.